I was lucky to have a poem written for the occasion by Tony Vincent Isaacs. Tony had previously put words to the music of Scott Joplin for the Swingle Singers 'Rags and all that Jazz' album. For this new poem, called Give us this day, I've written a very simple four-part setting so that the words (and their important message} are quickly understood. 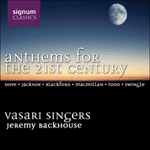 Signum Classics are proud to release the second disc from the Vasari Singers 'Anthems for the 21st Century'.